Yoga at home - what you need to know! Yoga at home—what you need to know! The ancient art of yoga is an extremely popular discipline followed by countless individuals who cherish the multi-dimensional aspects of its practice. So what exactly is yoga? A Hindu spiritual exercise derived from the Vedic tradition of India and the Himalayas, yoga brings together the union of breath and mind, enhancing ones self-discipline and is widely undertaken for health and relaxation. Individuals practice different body movements, techniques and postures, as well as breathing exercises, relaxation and concentration. Meditation is also an important part of yoga, and helps with self-inquiry, balance and harmony within one's life. If you have embarked on a regular yoga routine of stretching the body, soul and mind, the next thing you are going to want to do is ensure your home is comfortable, inviting, and a suitable place to practice. 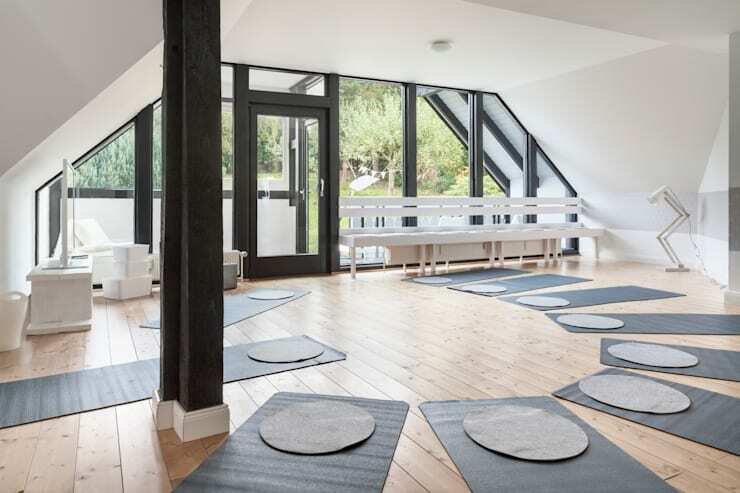 Today on homify we are taking a look at 6 essentials to creating the ultimate yoga space at home. Read on to learn more, and ensure you dwelling is tranquil, serene, and designed for true meditation and relaxation. First things first you need to choose a space within your home to accommodate your yoga area. This might be a converted spare bedroom, an outdoor patch of garden, a conservatory, gym, or a specially designed studio. Regular yoga practice can help relieve tension that builds up from a hectic schedule or a busy life. Additional, there are numerous health benefits to the mind, body, and heart. In creating a home practice space it doesn't necessarily mean you will forego your studio sessions, but there are plenty of benefits to creating an individual routine in the silence of one's home. To practice at home you need a mat, and space to move around in a 360 degree motion. Because you need so little, you might choose a corner of a room to start, and then build up to an entire room for your yoga. Pick a quiet area of your dwelling, preferably with minimal ornamentation or decoration. The next step to creating a comfortable yoga space at home is to ensure you only employ minimalistic and simple furniture within the space. Yoga focuses on alignment and the more space you have, the better you will be able to stretch out and move. Flooring should have a hard floor such as timber. Carpet is not ideal since it will make it difficult to balance, and can be undulating underfoot. If you want to feel an earthbound connection to your space, consider an area that utilises natural materials such as stone, wood, or bamboo. It is important to consider that hard floors can also be dangerous should you fall, and a yoga mat is essential for this. If you are practising on a very hard floor, look for a thicker mat that will help you feel safe and comfortable during your session. Additionally, many mats are made with synthetic materials, but natural options can often feel far more comfortable and are better for the environment. Finally, avoid practising your session in areas that are filled with adornments and objects as this can cause a sense of cluttered energy within the room, and disrupt concentration. Lighting is extremely important for your yoga session. Many of us neglect the impact that lighting can have on the ambience of a room, and this can affect the overall atmosphere of the space. You will want to maximise the natural light available in your light, as this is often the softest most calming illumination. Additionally, natural light promotes energy and can work brilliantly in effecting positive mood and health. Other lighting options can include candles, as well as soft illumination such as low-wattage lamps. The worst type of lighting is bright fluorescent light in a cool colour or tone. This is sure to evoke a harsh air within the room and should be avoided. What about sounds and smells? Climatic environment and ventilation is another element you will want to think about when planning your yoga space. Kitchens and other domestic hubs can be odorous and distracting, so it is best to choose a place where you will have silence and a smell-free space. If you listen to music during your practice add a player to the area, which can be particularly useful if you need to drown out any inevitable noise from other parts of your home. 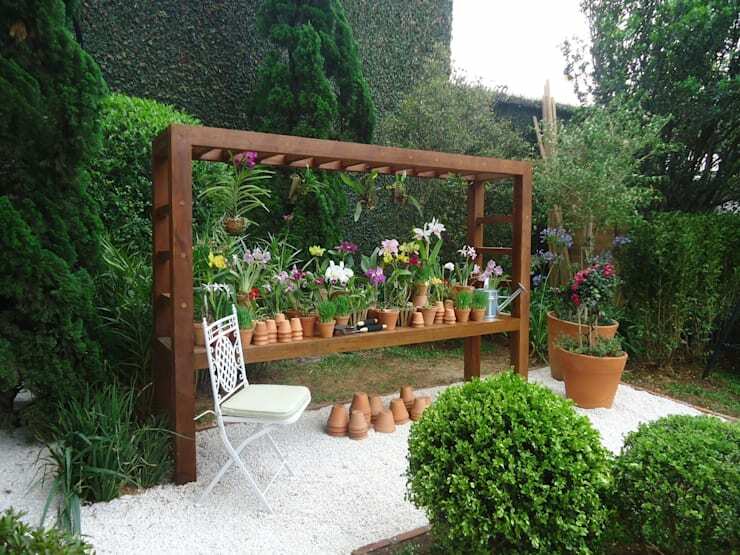 Plants are a stylish and suitable addition to many indoor and outdoor yoga spaces. They breathe life into a room, and can help evoke a sense of nature without feeling distracting. If you are unsure what to add to your space, consider some greenery and foliage. Not simply a pretty face, plants help the air in the room as well! They purify the atmosphere of an interior area, and can rid it of unwelcome toxins too. 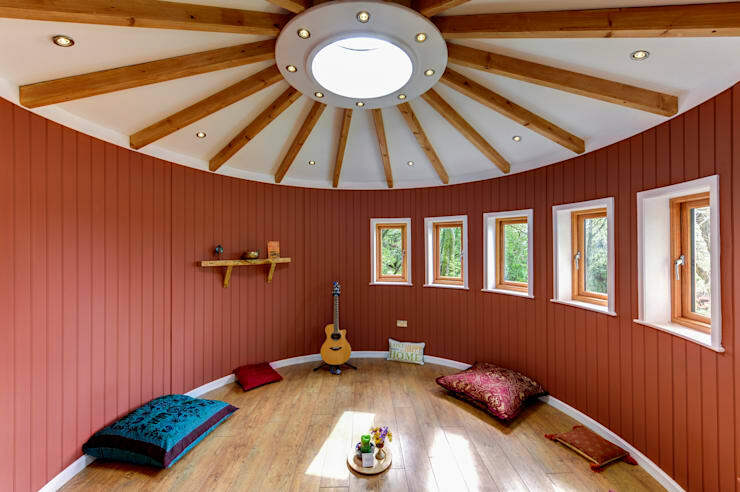 If you are unsure how to design your interior or exterior yoga area, you might want to chat to an expert to obtain some handy hints and terrific tips. Finally, yet no less importantly we arrive at the use of textiles and fabrics. Mats, pillows, throws, and other fabrics can be excellent for creating a comfortable space that you will enjoy visiting each day. 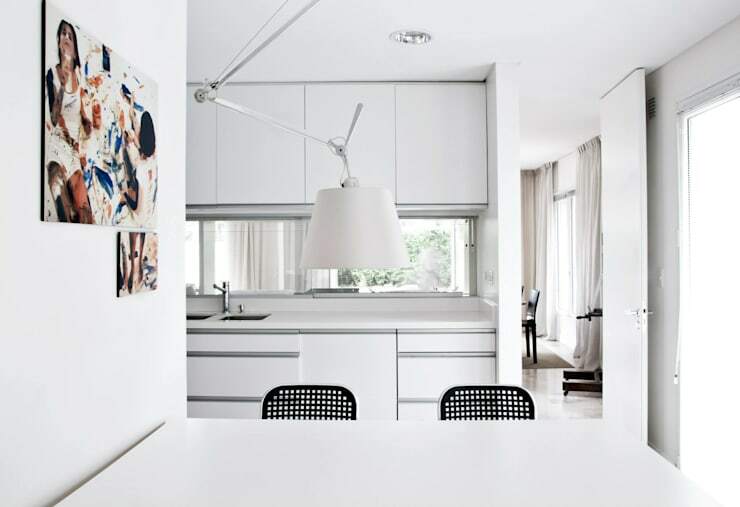 Try not to over fill the room, instead choosing a minimal amount of items that work to enhance the area. Floor cushions can work wonderfully, and add a cosy space to meditate, rest, stretch, or relax after your session. Choose colours that inspire you without distracting your practice, and pair with stylish yet comfortable throw rugs.